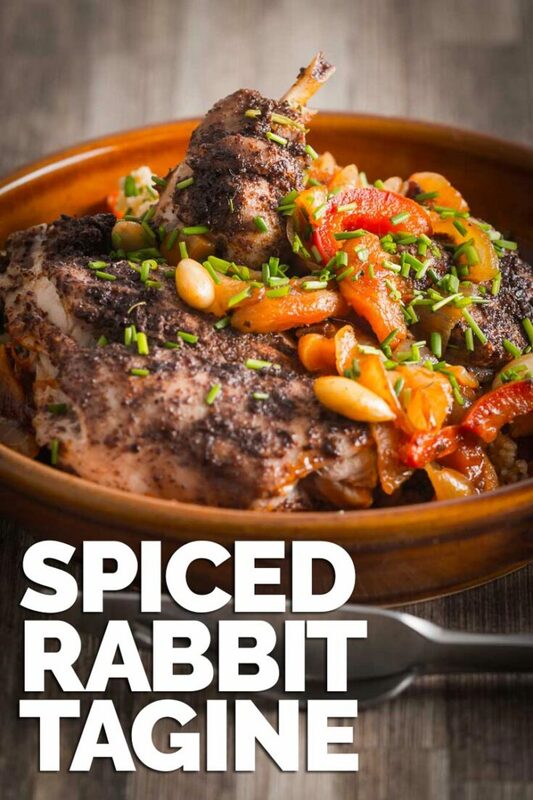 Rabbit is a beautifully lean and sustainable meat and this North African style spiced rabbit tagine is simple quick and wonderfully exotic. Rabbit has definitely fallen out of favour as a source of protein. 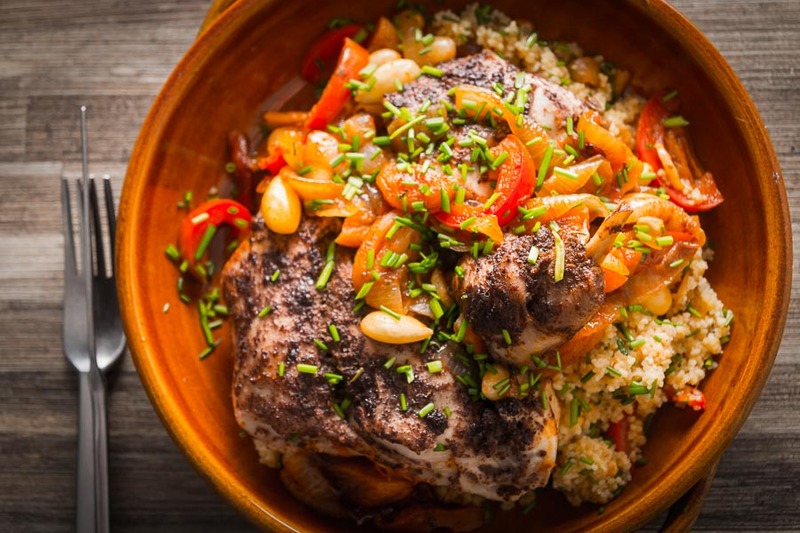 Hopefully, this rabbit tagine recipe helps convince at least one of you to try it! Once upon a time it was very popular and I am on a bit of ‘wild’ meat push at the moment. If this site does anything it represents what I eat. 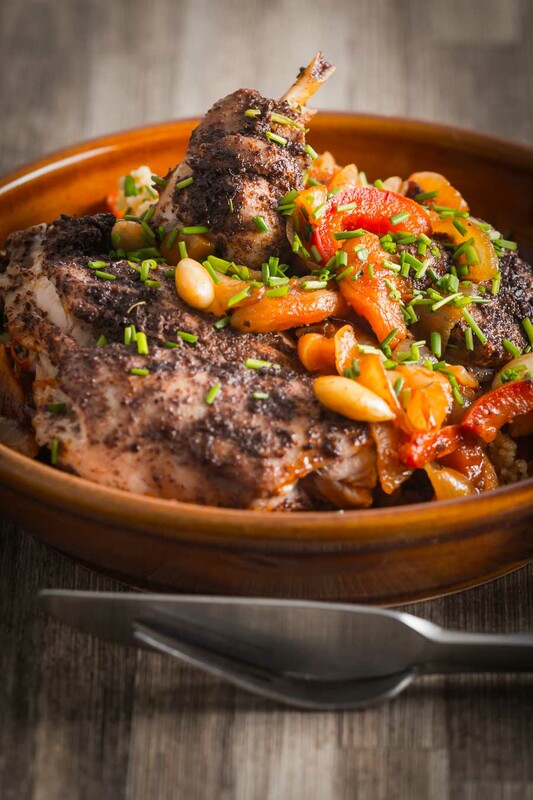 This spiced rabbit tagine is one of my favourite ways to cook with farmed rabbit. Farmed rabbit is a little a more subtle in flavour and a little more tender than a wild rabbit. As a result of this, you can cook it a little quicker. You do have to be careful as an overcooked rabbit is good to no one. 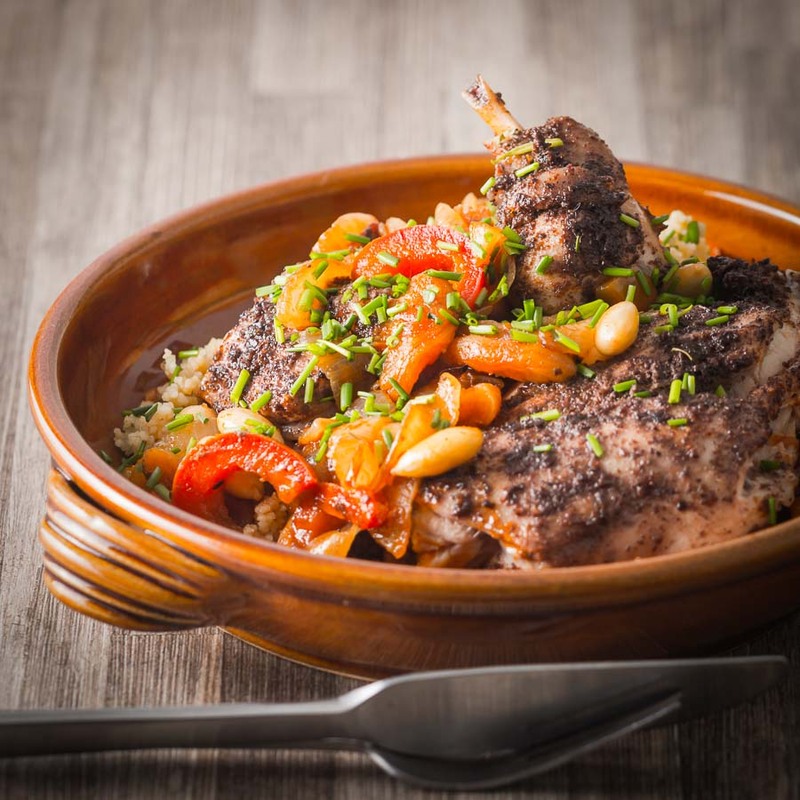 This rabbit tagine offers the perfect gentle way of cooking the meat. It almost steams in the juices from the peppers, onions and harissa. Not only does it cook the rabbit gently but it also imparts a lovely flavour to the flesh. Of course, I am aware that rabbit may not be the easiest of meats to get your hands on but it is definitely worth it. I also love the idea of introducing people to something new. Just like my recent venison stew or wild boar stew this recipe is all about planting a seed. If just one person of the many thousands that read my recipes picks up on one of these ideas and says, ‘why not, I’ll give it a try’ I will be a really happy bunny. See what I did there? And guess what if North African isn’t your mojo how about Italian? I have a rabbit ragu recipe and a simple pot roast rabbit pasta recipe. I can even stretch my rabbit recipes to Spain with a very traditional paella recipe! These meats are sustainable and fabulously tasty and as far as I am concerned they should be demystified. They are no more difficult to cook than beef, pork, chicken or lamb. My rabbit tagine has been developed with a farmed rabbit in mind, wild rabbit is a gamier than farmed rabbit and can have a tendency to dry out really easily. I would definitely not use wild rabbit for this dish so go visit your butcher and order yourself a farmed rabbit and put something new in your belly. As you can tell from my rabbit recipes I very much favour longer slower cooking or steaming techniques for rabbit. This is because the shoulder and leg cuts have a tendency towards drying out. Even more so with wild rabbit over farmed rabbit. It should be cooked until the internal temperature after resting reaches 71°C. If you are yearning for rabbit in a hurry you need to look for cuts of meat like the saddle or loin. As you may well imagine these cuts are small and require very precise cooking. In general, a rabbit should be cooked on the bone to help protect against overcooking. So no you are fully armed, off to the butchers you go! Mix a tablespoon of the olive oil with the sumac and massage into the rabbit and set aside. Add 1 tablespoon of olive oil to a frying pan with a lid that is oven proof and heat over a medium high heat, then add the onion and cinnamon stick and cook for 5 minutes. Then add the garlic and red pepper and cook for a further 5 minutes. Stir in the cumin, Harissa paste and honey before adding the almonds and apricots along with 1/4 tsp salt and 50ml water, stir and place the jointed rabbit pieces on top. Then add the lid to the pan and place in the oven for 25 minutes, the idea is to steam the rabbit so make sure it is a tightly fitted lid. Pour the boiling chicken stock over the cous cous and allow to sit for 10 minutes. After the rabbit has been cooking for 15 minutes fork through the cous cous and dot with the butter, then cover with a lid and then place in the oven with the rabbit for the final 10 minutes of cooking. When ready to serve, take a quarter of the vegetable mix and stir through the cous cous, then plate with the remainder of the vegetables and the rabbit. The cooking time will vary depending on your rabbit but the internal temperature when checked with an instant read thermometer should be 67°C when you remove it from the oven and should be rested until the temperature reaches 71°C. This looks lovely Brian, I haven’t had rabbit in years until a couple of years back and somehow I didn’t like that much anymore- we’ll, I can never say I was crazy about. This dish looks so amazing that I really want to give mr rabbit another try. I love the colours and the presentation of this dish. Superb as always. Rabbit is a funny meat done well it can be sublime but it is insanely lean and really needs to be cooked well to be edible. Haha, yes vets are the very best source of wild meat here too! I love cooking with rabbit! Stunning photos! I love the lighting! How long would I cook this on top of the stove in my tagine? Hey Raney… I had to do some research on this for you and it looks as though around 40 minutes should be good but I would personally check after 30 minutes as rabbit can dry very quickly. 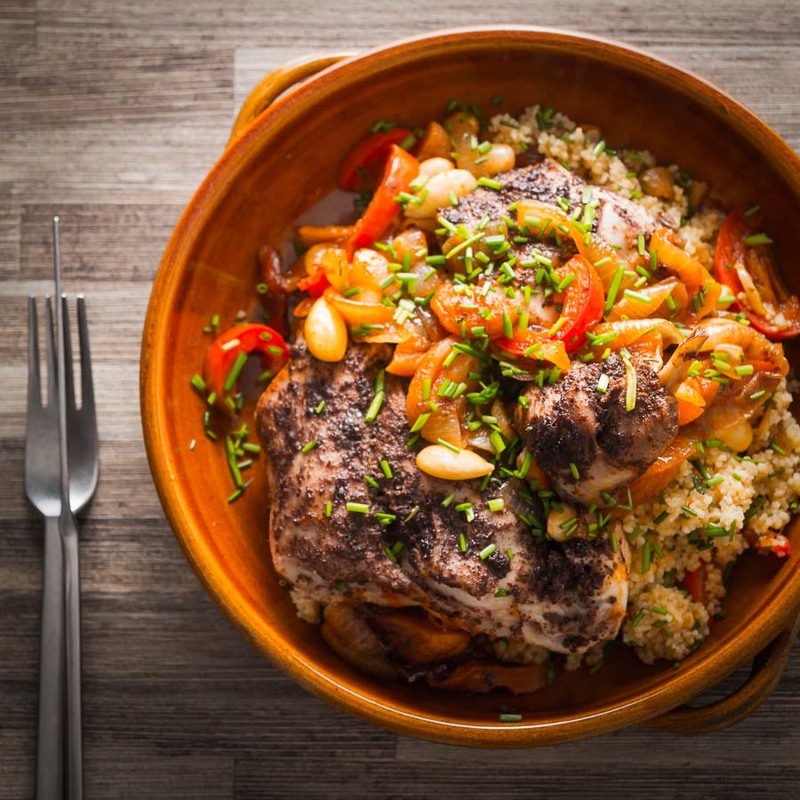 It is indeed, however the both the pot and flavours are very specific to a region making both notions correct, my cooking method aims to produce a similar ‘steamed’ approach to the food despite not using a tagine. WOW! That looks insanely tasty!!! I can’t even remember the last time I had rabbit either. I gotta find one and make this! You should defiinitely give it a go, you don’t even need a tagine 🙂 It is nothing more than a regional name for a type of stew, naturally the flavours are a little different but in essence lovely one put wonders of deliciousness and most importantly really simple. About 10 years ago we set ourselves a small challenge to cook with meats we hadn’t tried before, including rabbit. The rabbit pie we made was really tasty, but for whatever reason we haven’t cooked with rabbit since! You’re right that it seems to have fallen out of favour. Love the sound of this recipe with all those spices. I rarely cooked with meats out of the norm when I lived in the UK although always loved the least popular cuts, however they are much more available over here and really do offer something new to the dinner table. Looks delicious and love the spices combination. This is a comfort food, must try. This sounds incredible! It’s packed full of so many warming and delicious spices, I miss food like this! Thanks Emily, it is definitely a warming winter dish. Nooooo! You bunny boiler Brian! How could you eat a little, defenseless Miffy bunny lol. If I put aside my horror, I will say this does look extremely tasty (though it pains my bunny loving bones to say it lol).